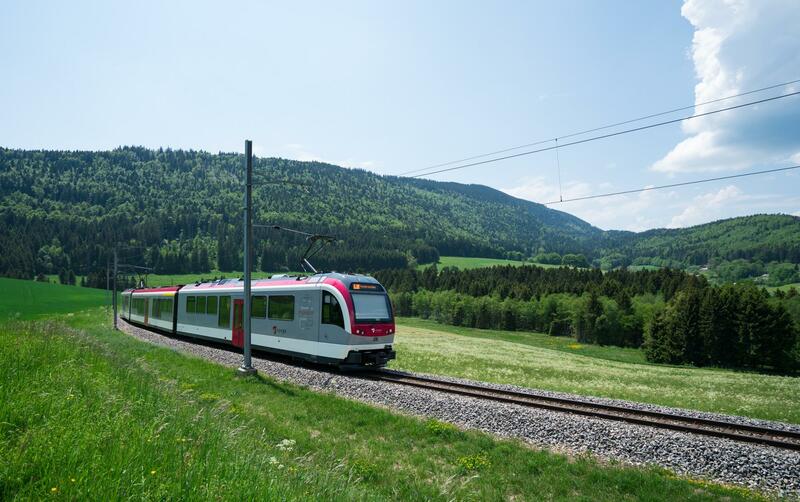 An ecological and enchanting method of transport, this train runs alongside the rock face of Les Aiguilles de Baulmes between the spa town of Yverdon-Les-Bains and the music box capital of Sainte-Croix. The spa town of Yverdon-les-Bains is linked with the natural, unspoilt countryside of Sainte-Croix/Les Rasses by a train running through pine trees and alongside rocky outcrops, offering stunning views over the plains and the Alps. The line was created in 1893 to transport workers from Yverdon-Les-Bains to Sainte-Croix, the world capital of music boxes since the early 19th century. Now the carriages welcome tourists from all over the world, local residents and lots of students. TRAVYS offers many connections on the Yverdon-les-Bains regional network, as far as the Vallée de Joux. For corporate events, you can book “La Traverse”, an old Rhaetian railway carriage which has been refurbished and transformed into a lounge and restaurant.